Home » What Are The Differences In The Kratom Strains? As a botanical substance, kratom is a product of variety and differentiation. Cultivation and harvesting techniques play pivotal roles in determining the characteristics and traits of kratom products, and as a result, no two kratom strains are exactly alike. While the plant’s sheer diversity creates a wider breadth of choice, it can also make choosing a kratom strain difficult amidst so many options. So, to help provide some clarification, we’re going to explore the different strains of kratom by examining their roots, characteristics, and discovering what ultimately sets them apart. Although dozens of kratom strains exist, most kratom strains can be classified as red, white, or green vein. However, kratom coloration isn’t merely cosmetic, nor is it the product of deceptive marketing. Instead, the three primary kratom colors are indicators of a kratom strain’s vein coloration, and more specifically, general aroma. Due to variations during the cultivation and harvesting phases, the stems or main veins of different strains of kratom often become tinted, appearing as red, green, or white/yellow. Farmers often use the vein coloration of kratom leaves as an indicator of maturity and a predictor of strain characteristics. 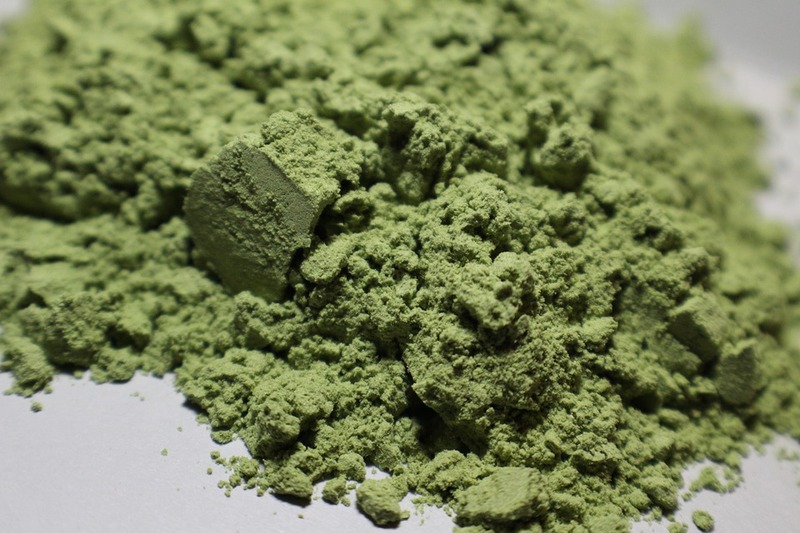 Aside from kratom vein color, coloration differences between different strains of kratom can also be observed after kratom leaves are ground into ultra-fine powders. As a result, some customers are often alarmed when they notice that their powdered kratom products are darker or lighter in appearance. For example, red vein kratom powders tend to have a dark brown-red appearance, while white vein kratom is often pale or yellow by comparison. Ultimately, the coloration of kratom strains will always be subject to variability. Depending on the conditions in which the tree grew and variables during harvest, even two batches of the same strain can look different. Don’t let these inconsistencies bother you, though – if anything, they’re healthy reminders that kratom is an organic product of nature, not artificiality. Even though kratom strains tend to fall into three major color categories, dissimilarities can be observed between different strains of kratom of the same color. This phenomenon has lead to the popularization of kratom strain names, which serve to further differentiate kratom strains from one another. Most commonly, kratom strain names refer to a strain’s region of cultivation. As an example, Green Vietnam kratom refers to the strain’s purported origins within the country of Vietnam. However, the etymology of other strain families is often more cryptic in nature. For instance, “Maeng Da” is a family of kratom strains named after their potency and quality rather than a specific region. As previously mentioned, much of the disparity between the different strains of kratom can be explained by the time-sensitive nature of the kratom harvesting process. That’s because, unlike other plants, only one species of mitragyna speciosa (the kratom plant) exists. If a kratom farmer wants to grow a different kratom strains, the process doesn’t begin with Maeng Da seeds or Borneo cuttings. Instead, kratom strains as we know them are loose monikers that kratom farmers use to collectively distinguish between their various kratom harvests. When kratom leaves have reached an ideal maturity, kratom farmers pick and collect them. Over its lifespan, a kratom leaf will typically change in coloration from red to green, to yellow, and finally, brown. This phenomenon of “color cycling” allows kratom farmers to essentially choose the coloration of their harvest dynamically and produce red, white, and green kratom simultaneously, even though all of the plants are technically the same species. Aside from techniques employed during the harvesting phase, some kratom strains are actually byproducts of post-harvest processing methods. For all kratom strains, the post-harvest process begins with a thorough cleaning in running water to cleanse the freshly-picked leaves of any dust, dirt, debris, or other contaminants. This step is essential in producing high-quality kratom, as these same leaves will later be crushed and ground into a fine powder, making imperfections and contaminants difficult to spot without the use of lab testing. After the kratom leaves have been rigorously washed, they’re hung or placed on large racks to dry inside or in the sun. This drying or “curing” phase is yet another factor in the development of different strains of kratom, as kratom farmers can either limit or extend drying times to further alter the natural traits of the leaves. Once a batch of kratom leaves is sufficiently dried and cured, kratom farmers use industrial grinders to grind the leaves into a fine-grain powder. At this point, the majority of kratom strains are ready to be packaged and shipped. However, some strains undergo secondary processes that further alter their characteristics and alkaloid compositions. Bentuangie kratom, for example, is created through a secondary fermentation process that results in the strain’s signature robust, earthy aroma. On the other hand, enhanced and “super enhanced” kratom strains are produced by fortifying kratom powders with additional alkaloids for improved potency. For centuries, various indigenous populations within Southeast Asia have grown and harvested kratom. Now, as the plant’s global popularity continues to soar, kratom farmers have diversified their harvests with the introduction of new techniques and processing methods. Even though different kratom strains technically originate from the same mitragyna speciosa plant, each serves to broaden the landscape of customer choice further and cater to the unique, individual preferences of thousands of people from around the world. For those who struggle with feelings of restlessness, the relaxing aromas of red vein kratom strains can be conducive to winding down after a long, exhausting day. On the other hand, the strong, stimulating aromas of white vein kratom strains can prove to be an invigorating jump-start to otherwise listless mornings. Meanwhile, most green vein kratom strains serve as a balanced middle-ground between red and white strains, producing an aroma that’s soothing but simultaneously energizing. Most kratom vendors carry dozens of different kratom strains, providing a sizeable variety that tends to excite repeat buyers. However, the same diversity of choice often manages to perplex and overwhelm new customers who aren’t already familiar with terms like Maeng Da and Bali. Ultimately, amidst so many options, finding the ideal kratom strain for you can be a lengthy process that requires patience, time, and plenty of experimentation. As a result, many veteran kratom customers recommend starting with classic strains like Bali and Borneo before exploring the more exotic offerings such as Bentuangie or enhanced variants. That said, your journey with kratom is entirely your own, so don’t be afraid to travel off the beaten path! Whether you’re looking to find a new favorite kratom strain or get acquainted with the classics, choosing quality, reputable kratom will go a long way towards ensuring your experience is both enjoyable and safe. At Kratora, our hunt for the highest-quality kratom led us around the world in search of the most esteemed suppliers. Today, our wide selection of organic, premium-grade kratom is the result of forming ongoing partnerships with reliable, trusted growers. From Sumatra to Maeng Da, all of our kratom products are all-natural and don’t contain any chemical additives or filler ingredients. Simply put, if it’s not a product of nature, it’s not in the bag. Since 2013, we’ve devoted ourselves to crafting a truly remarkable online kratom shopping experience that inspires confidence in our customers every step of the way. All of our different strains of kratom are backed by a full 30-day refund guarantee, and we’re proud to offer quick US shipping on all domestic orders. Shop with us today and get same-day shipping on all orders placed before 3 PM EST Monday through Friday and 1 PM on Saturdays (excluding holidays).